Joshua was born in Cincinnati, Ohio. He started dancing at the School for Creative and Performing Arts. After continuing his training with the Orlando Ballet School, under Peter Stark, Joshua joined Houston Ballet II to work with Claudio Muñoz. In 2009, he joined Tulsa Ballet and was promoted to Demi Soloist in 2014. Joshua also spent a year with Sarasota Ballet as a Demi-Soloist. After returning to Tulsa, Joshua was promoted to Soloist in 2018. Some of his repertoire includes leading roles in The Green Table (Jooss), Onegin (Cranko), A Million Kisses to My Skin (Dawson), Concerto (MacMillian), The Mirror Walkers (Wright), Age of Innocence (Liang), A Midsummer Night’s Dream (Wheeldon), ONE/end/ONE (Elo), The Nutcracker (Angelini), Extremely Close (Cerrudo), among others. 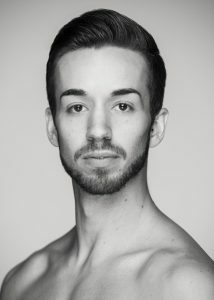 As a choreographer, Joshua has created works for Tulsa Ballet II and the Helsinki International Ballet Competition.